“I rarely bottle from a single vineyard; I believe that blending from my vineyards across several zones in Montalcino yields a wine of greater complexity and balance.” And so it goes with the 40-year-old Giancarlo Pacenti, the son of Siro Pacenti who took over as vignaiolo of the family winery in 1988. If you talk to produttori in the Montalcino area, you’ll find that Giancarlo has earned quite the reputation with his break from classic Brunello di Montalcino tradition, yet his wines still embody the sweet soul of Brunello and the region. I’ve always believed that wine making can evolve and improve while carrying the best of local tradition with it. Giancarlo embodies this concept, having collaborated with the University of Bordeaux over the years, taking the best knowledge of more modern methods and fine-tuning his care of the vineyards and wine making process. 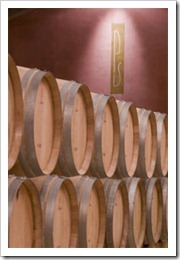 For example, most Brunello producers use large Slovenian oak casks, or botte, to age their wines. Giancarlo has largely done away with them, now aging his wine entirely in small French oak barriques yielding a richer, fresher wine than his fellow Brunello producers. As you might imagine, this has rubbed Brunello traditionalists the wrong way, but it’s hard to argue with the man’s success. Brunello di Montalcino DOCG is considered by many to be more regal and elegant than it’s Chianti Classico and Vino Nobile di Montalcino Tuscan brothers. This “nice little dark one” is made from 100% Sangiovese Grosso grapes, and the Brunello clone of Sangiovese is unique to the Montalcino area and has evolved and adapted to the area’s distinct climate and terroir. (Find out more about the origins of this clone on Tom Maresca’s blog post). Siro Pacenti develops more complex and elegant wines than most Brunello producers by taking advantage of the distinct local climate differences around the Montalcino hill town. 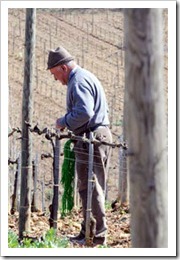 “We blend grapes from our northern vineyard in Pelagrilli where there are fewer hours of sunlight and the grapes tend to ripen more slowly, with grapes from our southern vineyard in Piancornello where intense sunlight and more maritime winds contribute power and complexity to the wines,” explains Giancarlo. 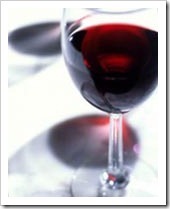 Interestingly, you will find varied opinions of Giancarlo’s wines depending upon where the taster stands. Robert Parker’s Wine Advocate gushes on Giancarlo’s 2004 Brunello, giving it 97 points, which makes sense when you consider that Wine Advocate tends to favor wines made in the more international style. However, Gambero Rosso’s Vini d’Italia (Italian Wine), a necessary reference for any serious Italian wine fan, tends to favor classic regional wine making methods and has only awarded two out of three bicchieri to Siro Pacenti Brunello wines for the last few years. For the American palate, I favor Siro Pacenti’s wines as an elegant introduction to the essence of Brunello while highlighting what can be done to exalt the unique virtues of Sangiovese Grosso. Nothing demonstrates Giancarlo’s brilliant innovation better than a tasting of his wines. I had the pleasure of sitting down with Giancarlo at Vinitaly to taste his elegant riserva 2004 “PS” and 2005 Brunello and 2008 Rosso wines. While these wines have not yet arrived in the States as of this writing, the Brunelli hold great promise and are well worth the wait. In the interim, Giancarlo’s 2004 normale Brunello and 2007 Rosso wines are drinking well now and are great options available throughout the US – see my retailer recommendations below. (N.B. cool bottle photos compliments of David Gettenberg at Englewood Wine Merchants). 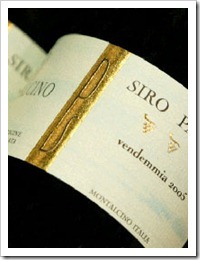 2004 Siro Pacenti Brunello di Montalcino PS. Giancarlo Pacenti is best known in Montalcino for taking exception with the local wine making tradition of using Slovenian oak botte for aging, yet his 2004 riserva ”PS” Brunello adopts more closely the classic production methods. While still spending the required 36 months in wood for riserva status, in this case mostly new French oak, Giancarlo selected a single, old-vine plot near the Pelagrilli estate for his PS wine, his first-ever single vineyard Brunello. The bottle we tasted had been open for an hour or so, and the wine shows a fresh, fruit-driven nose that is rich in ripe plum and black cherry. In the mouth the elegance of the wine comes through, and while the 2004 PS will need a few years to evolve, already the flavors and aromas are well articulated. I was struck by the seemingly endless progression of sensations, with dense fruits of blackberry, currant, black cherry and pomegranate. Spice from the fruit and oak were subtle and pleasing, with light vanilla and a hint of nutmeg, and some floral notes of violet and fennel drift through the senses. Even with a good amount of tannin and the characteristic high acidity of Sangiovese, the silky texture of the wine is very pleasing and the finish goes on and on. 2005 Siro Pacenti Brunello di Montalcino. You won’t mistake Giancarlo’s 2005 Brunello for either the 2004 PS or normale Brunello wines, yet it’s an interesting and pretty wine bursting with red berries and plums, a nose with floral notes of violet and rose, and a soft finish with medium length. Giancarlo views this vintage as “ready to go now,” although a year or two of aging might balance out the fruit. Few wines can be called seductive, but the forward fruit, medium body and floral notes will seduce you into buying a case or two. 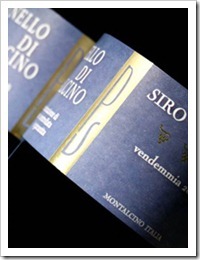 2008 Siro Pacenti Rosso di Montalcino. I like the Rosso wines of Montalcino as a great way to taste the essence of Brunello and its maker’s style, without having to shell out $60-100/bottle. Giancarlo makes his Rosso by blending wine from his younger vineyards with casks of Brunello that may not hold up to the mandatory oak aging requirement of Brunello. Think of it as a second selection of barrels that don’t quite make the Pacenti Brunello standard – still a delicious wine for just $20-35/bottle retail. While most “baby Brunello” wines should be drunk within 2-3 years of release, a few of Giancarlo’s Rosso di Montalcino wines still drink well after 5-10 years. After a strong showing with his standout 2007 Rosso (buy it if you can find it), Giancarlo’s 2008 can’t quite meet the standard set by his previous “baby Brunello” vintage. That said, the 2008 Rosso presents pleasing notes of red cherry, herbs, a touch of coffee and black pepper on the nose, and delivers a pleasant burst of fruit on the palate. The tannins are a bit rough and heavy, more than you might expect for Rosso, but Giancarlo has still done a very good job and this wine will please enthusiasts for the next several years. If you’re in the Montalcino area on your next trip to Tuscany, the Pacenti family welcomes visitors if you give them a little notice. 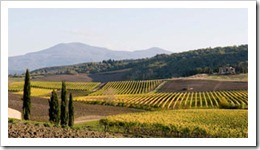 Giancarlo’s cantina is located at his home northeast of Montalcino and easily reachable off the picturesque via Cassia SR2 that winds through the Val d’Orcia. From Siena, follow SR2 south about 40km, then take a right onto route SP45 about 2 km past the medieval borgo of Buonconvento (Hungry? Try the Bistecca alla Fiorentina at Ristorante Da Mario at Via Soccini, 60 in Buonconvento, a delightful gem you’ll find in my Osterie d’Italia guidebook recommendation). After driving 5 km on SP45, you’ll see signs for the tiny town of Pelagrilli and Azienda Siro Pacenti; take a left at the junction and drive the winding road for 2 km where you’ll see the entrance to Siro Pacenti. Their address is loc. Pelagrilli, 53024 Montalcino, Italy. Since most Italian producers don’t have elaborate tasting rooms like American wineries, you’ll need to make an appointment. You can reach the family via email, or call them at +39.0577.848.662, or on Giancarlo’s mobile at +39.335.361.469 . Ciao. For those of you waiting patiently for the new release of Siro Pacenti wines I mention in my blog, I highly recommend you try Giancarlo’s 2004 Brunello di Montalcino and his 2007 Rosso di Montalcino. These wines are on my list of all-time favorites for their style, and the prices on the open market are very good. If you can’t find these at your local retail shop, just order them online. For most of the retail shops I list below, shipping will run you only $2-4/bottle, a small percentage of the price of the wine. Ciao — another quick update on locating the Siro Pacenti Brunello 2004: It looks like Vins Rare is out of stock and won’t be getting any additional ’04 stock in (thanks for buying them out! ).